Fatigue, left over from the previous days 19 hours travel, provided the excuse to delay our walk and stay an extra day at the Hotel TrompeterSchlössle to further explore the Kathedral and city of Konstanz. Up at 6 am after an (unusual for us ) 11 hour sleep, we readied ourselves to be at the ‘included’ breakfast by 0700. I thought it began at 7; Tilly thought our host had said 7:30. Both of us were wrong… we waited until 0800. Our mission back to Konstanz had to be delayed for a while. A 0900 Mass was being celebrated. Being a tourist wandering the Kathedral while the congregation was trying to worship would be crass. So I suggested we revisit and photograph a unique water feature/ sculpture/ fountain thingie we had passed by the previous evening, then visit one of the three outdoor sports stores in the area. I didn’t recall why, but it seemed a good way to kill the time until Mass was over. We got to the fountain BUT last night we had not seen this! My first comment was “Is that us at the end of our first day?” Tilly and I looked at each other and laughed. After quickly praying that the pool was not prophetic, it was off to the Magic Mount sports store. Two pair of pants, a quick drying towel, three plastic containers, and a plastic bottle later we left 179 Euro poorer. Each of us had purchased a new pair of hiking pants. Mine were bright blue, Tilly’s were green. Ironically, the pants were Unisex and same size fit both of us. I joked if Tilly was feeling blue on a given day we could switch. We had just added extra weight to our packs after spending weeks trying to eliminate unnecessary ounces. I joked that I would need a much larger pack if we continued to shop. We found it right outside. Finally we made it. TheKathedral of Konstanz – Basilika Unser Liebe Frau Konstanz – (built in the 10th century) was a significant point for pilgrims to meet. Inside the Kathedral is the Mauritius rotunda (dating from 900 AD) with a replica of the Holy Sepulcher (added in the 13th century). 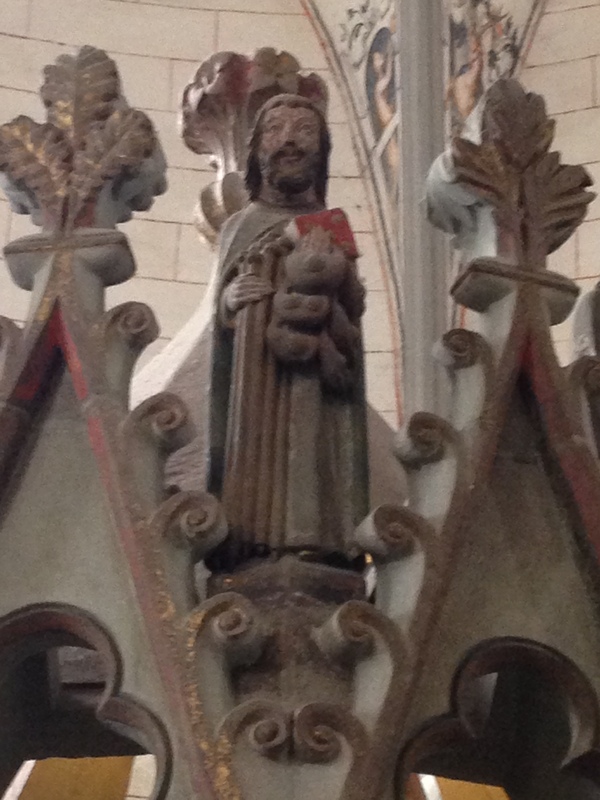 St James (Jakob), one of the twelve apostles stands with seven pilgrim staffs and bags, scallop shells attached ready for pilgrims beginning the journey. We thought this a good place start. The rotunda however, was filled with loud tourists and their guides (each yelling the explanations of what their respective groups were seeing). We returned to the Kathedral and sat for a few minutes considering the significance of what we were beginning. 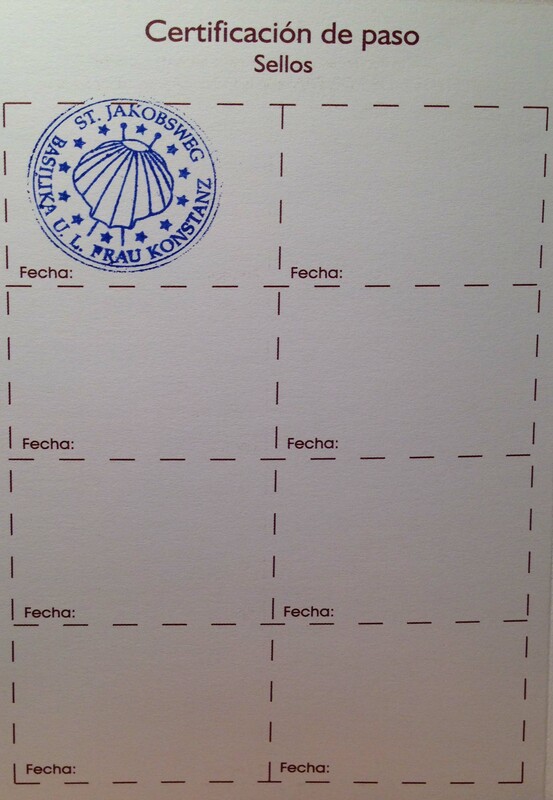 I decided to ask the clerk behind the information counter to stamp our Pilgrim passports (aka Credentials). ThePilgrim Passport/Credential is the document that “proves” you have actually made the journey. 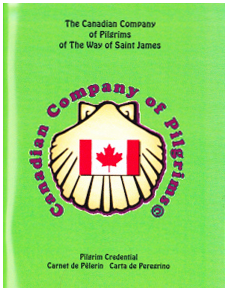 I had all summer long periodically reminded myself (and then forgot) to order (after joining) the passports from the Canadian Company of Pilgrims. At T minus 5 days for our trip I remembered! The CCoP website said to allow 3 – 4 weeks for turn around and delivery of credentials … OOPS! There were other places to get the Credentials … but, the hangup was timing . How to get the credentials before we began walking. 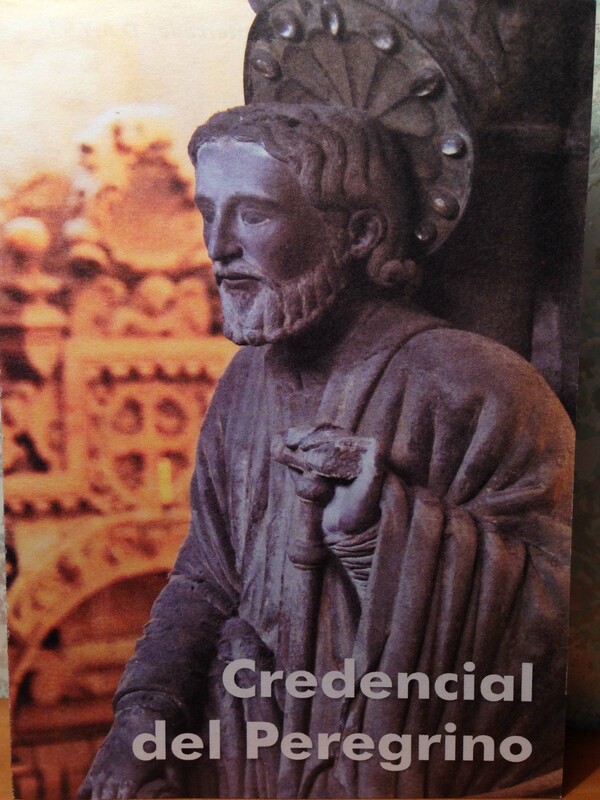 I had seen a number of “fast service” reviews for The Camino Forum Store (in Santiago) online. I placed an order, gave shipping address in care of the Hotel TrompeterSchlössle, sent off an email to the Hotel asking them to accept delivery for us and hoped. They arrived two days ahead of us. So, instead of having a Pilgrim Credential from Canada. We have Cedencial del Peregrino from Santiago. I like this classical style better! Before I could even ask, the clerk saw the passports in my hand a said ” Oh, you vish to haf a stamp?” I said yes; he stamped. We sat a for a while longer and I pondered again…what are hoping to achieve walking 2300+ km?… Why? …We’re NOT hoping for an epiphany or seeking enlightenment… we’re going to trace the historic routes thousands of religious pilgrims have taken over centuries. Maybe this simple journey about just being … moment to moment. We tried a number of ‘trial’ packs, each time eliminating items. Once, I took the pack to the treadmill and walked 5 km at a 6% grade,… just to see how it felt. But, my real concern was for Tilly … her hip and then back was giving her problems (aches and pains) off and on … could she ( and me too) withstand the rigors of a 100km walk over a 6 day span? For the last 6 months we had seen two different doctors… a couple of physiotherapists … finally, three days before we were to leave, we went to a chiropractor who in one session eliminated the pain – at least temporarily… more we hope. 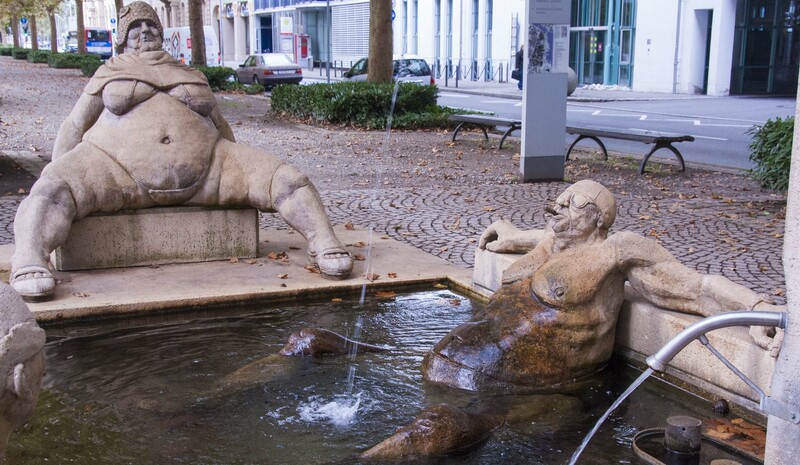 We are tempted to fall onto our bed and crash for the night, but decide to explore in hopes of finding the Kathedral of Konstanz our guide book said was the starting point for the Jakobsweg.…. Google, Google Maps, iPhone maps were of little use.. the Kathedral of Konstanz would not be found….. Using the map our host had given us, we managed to find The Basilika Unsere Liebe Frau Konstanz.. Only after Tilly asked the woman behind information counter if the Basilika was also known as the Kathedral of Konstanz did we confirm our starting point. Better though, is our discovery that the opening parade for Oktoberfest is forming up right outside in front of the Kathedral. After a brief look around we hurry out to sit, have a beer/wine and watch various traditionally dressed bands march, drum and play their way out of the Kathedral square after consuming copious amounts of the freely flowing beer. I had always thought Oktoberfest was celebrated throughout the month of October. I/we did not know that it began the evening of the 18th of September and continued for two weeks until October 4. 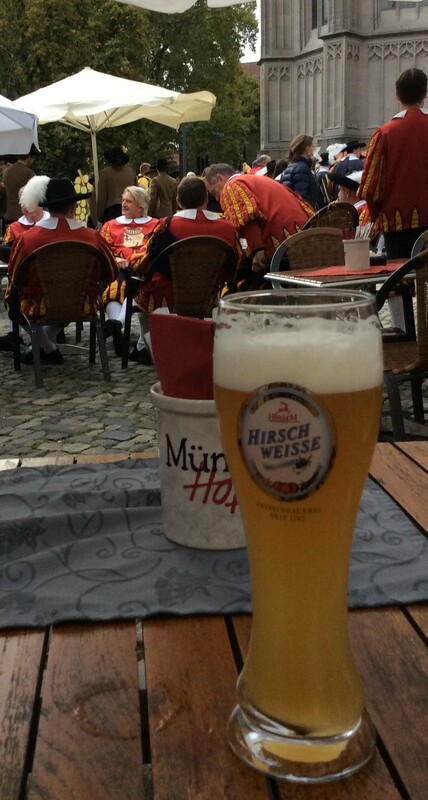 I like it… the Germans complete a month of beer consumption in two weeks … fast track honest debauchery. I consider that there might be a conflict between the purpose of our journey… the walking of a sacred pilgrim path… and celebrating Oktoberfest But, it all fits. We are here to experience the pilgrims path and the culture of the region.